Adrien Comeau - VE3IAC: RFI is the worst kind of noise. RFI is the worst kind of noise. S9+ levels were regularly "achieved"
Most significant in the evenings but not there in the mornings. I suffered through the winter and in the spring it seemd to dissipate. Now that winter is back so is my old firend. I decided to take a fact based approach to tracking this down and this is the start of what I hope is a very short journey, but some how doubt it. Noise is most noticeable in the evening hours. S9 noise levels are generally exceeded. 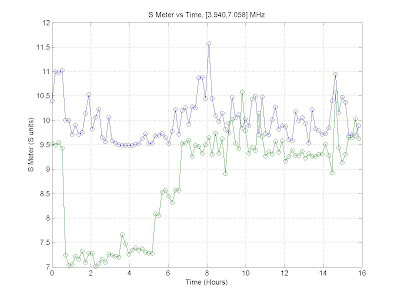 The plot above is the result of reading my rig's S-Meter every 10minutes over a period of 16 hours. I measured 2 frequencies 3.940 and 7.058 MHz. (This was done with some programming. I did not sit in front of my rig for 16 hours). Readings started at 11:44PM. 3.94MHz is in Blue, 7.058 is in green. Rig was set in AM mode. I note that at 30 minutes in, the the noise at 7MHz dropped >2 S-units (>12dB) , but then at about 6 AM the noise level creeps up again. 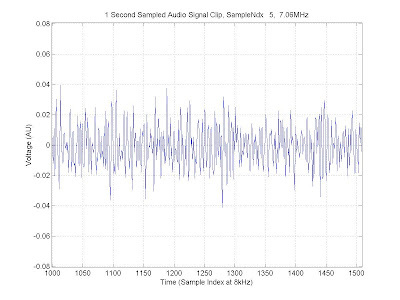 4MHz does quiet to a limited extent but never drops below S9. The plots above belong to the the audio output of the Rig when tuned to 7MHz. 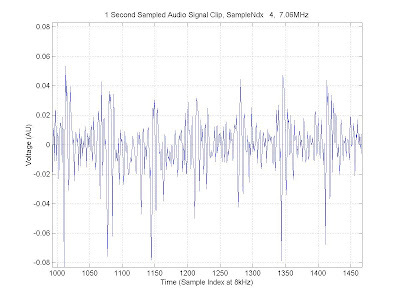 Time domain signal is very typical of that I hear and see. 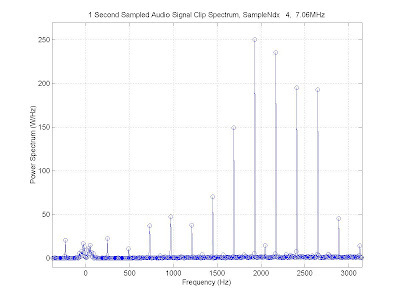 Notable signature is the high frequency content "spikes" which occur at a rate of 120Hz. 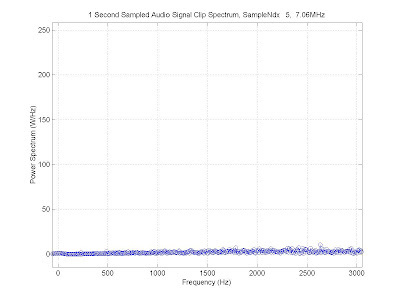 (There's a good hint) The spectrum of the audio signal demonstrates the harmonic content of the noise. Very broad band and is spread throughout the audio band. This sample was taken just before the 2S unit drop. On the next audio sample after the S-Meter had dropped 2 units, I can see that the noise is completely gone. Humm,... something got turned off? Hold that thought. PAR electronics makes a handy HPF which is used as a AM broadcast block filter. The image above is the frequency response of this filter from PAR's website. 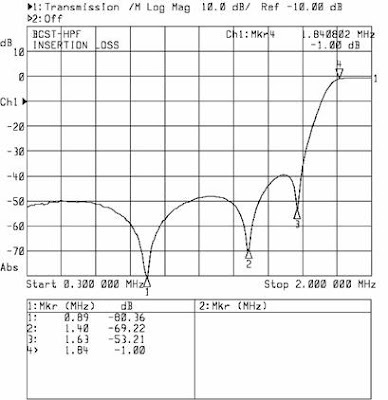 This filter provides >50dB of rejection of frequency content below 1.6MHz. The application of this filter makes no difference to the noise level. Effects I-COM 7000 and FT2000D the same. Tripping the main breaker in the house has no effect. Occurs from 1.7MHz to 17 to 18MHz. I have decided that what I am looking at is power line noise. and have concluded this after reading the ARRL's description of power line noise. Filtering at the receiver will be of no help as the RFI is broad band and extends across the entire 160M to 40M bands. The period of the noise waveform agrees with this conclusion. As to the intermittent nature of the RFI, I suspect that the interference generator is temperature realted as this would explain the sesional and perhaps even daily cycles. The only remidy is to physically locate the source and seek a remidy at the source. Next steps will focus on locating the source.